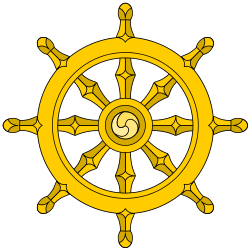 Buddhists take refuge in the Three Jewels or Triple Gem, (aka the "Three Refuges"). Refuge is common to all major schools of Buddhism. Pali texts employ the Brahmanical motif of the triple refuge, found in Rig Veda 9.97.47, Rig Veda 6.46.9 and Chandogya Upanishad 2.22.3-4. Veneration of the Three Jewels, Chorasan, Gandhara, 2nd century AD, schist - Ethnological Museum of Berlin. Faith is an important teaching element in both Theravada and Mahayana traditions. In contrast to perceived Western notions of faith, faith in Buddhism arises from accumulated experience and reasoning. In the Kalama Sutra, the Buddha explicitly argues against simply following authority or tradition, particularly those of religions contemporary to the Buddha's time. There remains value for a degree of trusting confidence and belief in Buddhism, primarily in the spiritual attainment and salvation or enlightenment. Faith in Buddhism centres on belief in the Three Jewels. A student who takes refuge may make vows to adhere to the Five Precepts (pañca-sila). Laypeople undertake at least one of the five, but traditions differ in how many vows are common to take. The Five Precepts are not commandments, such as "thou shalt not ...", but are promises to oneself: "I will (try) ..."
To refrain from taking that which is not given (stealing). Serious lay people or aspiring monks may take an additional three to five ethical precepts, and strengthen some of the five precepts. For example, the precept pertaining to sexual misconduct becomes a precept of celibacy. In Tibetan Buddhism there are three refuge formulations, the Outer, Inner, and Secret forms of the Three Jewels. 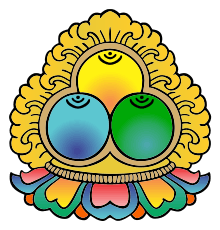 The 'Outer' form is the 'Triple Gem', (Sanskrit:triratna), the 'Inner' is the Three Roots and the 'Secret' form is the 'Three Bodies' or trikaya of a Buddha. These alternative refuge formulations are employed by those undertaking Deity Yoga and other tantric practices within the Tibetan Buddhist Vajrayana tradition as a means of recognizing Buddha Nature.